Why Low Oil Prices Will Not Last - Wall St. for Main St.Wall St. for Main St. The general consensus that the decline in oil prices is a gift to consumers due to the lower fuel costs at the gas station is short sighted and unrealistic. This isn’t because of lower fuel prices and their effects on the economy, but because of the belief that these low fuel prices are going to be permanent. In my opinion, these current oil prices are temporary because most shale oil producers are unprofitable at this current oil price. 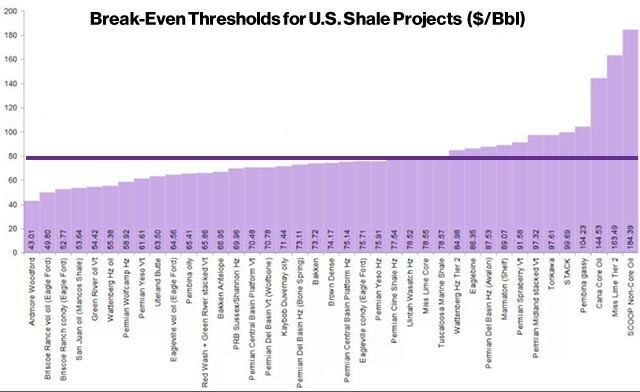 According to this chart from Bloomberg, the breakeven price for the majority of US shale oil producers is $80 per barrel. Extraction costs are significantly higher than the price of oil being produced. A sharp decline in the exploration and production of oil will follow suit and this is already happening. US oil producers are already abandoning rigs at their highest pace since 1991. In November, the number of oil and gas permits being issued declined by roughly 40 percent, while the number of overall rigs have declined by a total of 109 units. When looking at the most recent rig count statistics, November doesn’t seem to be an unusual month, but rather the beginning of a new trend. In the month of December, the number of overall rigs declined by 43 units, and for the week ending in January 9th, 2015, the US rig count declined by 61 units. It’s not just the US shale producers that will have financial trouble if these oil prices persist, oil rich countries will have financial trouble as well. Iran, which is the 4th largest oil producing country in the world, will need an oil price of $131.00 to balance its budget; and Russia, the world’s largest oil producing country, will need an oil price of $107.00 to balance its budget. Low oil prices could destabilize these two countries, and if this does occur, oil production in Russia and Iran will sharply decline, thus decreasing market supply in a significant manner. It’s not just Iran and Russia that are facing financial difficulty; Venezuela is also facing a fiscal crisis of its own. It is estimated that Venezuela will need an average oil price of $151.00 in order to balance its budget. If current prices are sustained, a default on Venezuela bonds, followed by civil unrest could take place very soon. This would ultimately bring Venezuelan oil production to a grinding halt. If this were to happen, it would greatly curtail future oil supply because Venezuela is estimated to have the largest amount of oil reserves in the world. Venezuela is in a much more precarious position than most of its OPEC peers, because they depend on oil for 95% of their export revenue. Their fiscal situation has gotten so dire that some economists believe that a default on its bonds could occur this year. This is because its cash reserves are estimated to be only around $21 billion dollars. In fact, Venezuela is already failing to pay its residents for basic necessities such as pharmaceutical imports, food, and airline bills. Saudi Arabia, who has been credited for the decline in oil prices, will also need higher oil prices to satisfy its fiscal needs in the future as well. Ninety percent of government revenue is comprised of oil exports and this year, Saudi Arabia is estimated to have a $38.6 billion budget deficit, with an estimated oil price of $55-$63 per barrel. Despite these projected deficits, Saudi Arabia will be unable to cut government spending due to domestic dissent and military involvement in regional affairs. This is why annual spending has increased by 52 percent since 2010. In fact, in March of 2011, during the height of the Arab Spring, Saudi Arabia pledged over $100 billion of financial handouts to its citizens, as a way of keeping its citizens pacified. These benefits include $66.7 billion dollars for new housing developments, welfare benefits for the unemployed, a raise in the minimum wage, a 15% salary increase for public sector employees, and higher stipends for students. If these oil prices persist, Saudi Arabia will be unable to keep the promises it has made to its citizens, and as a result, a political revolution would occur. If this were to happen, oil prices would spike rapidly. This is why Saudi Arabia won’t keep oil prices low for long, they simply can’t afford to. Oil demand is another reason why these prices won’t stay low for an extended period of time. Worldwide oil demand is projected to increase by 38% up to the year 2040, and Schlumberger also believes that oil demand will start to rise in 2015. It is also basic economics that when the price of a good declines, the demand for that good will start to increase, due to new consumption habits entering the market. As the price of oil declines, an increase in consumption demand will soon follow. Overall production costs combined with growing worldwide demand are the reasons these low oil prices will not last.